Toaster oven roasted red peppers make a flavorful addition to any meal, from pizza to frittatas and everything in between! 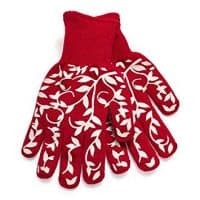 They’re great to have on hand and can even be frozen. From the grill to the stovetop, there are a lot of ways to roast bell peppers. If you’re roasting just one or two peppers then your toaster oven is the right appliance for the job. 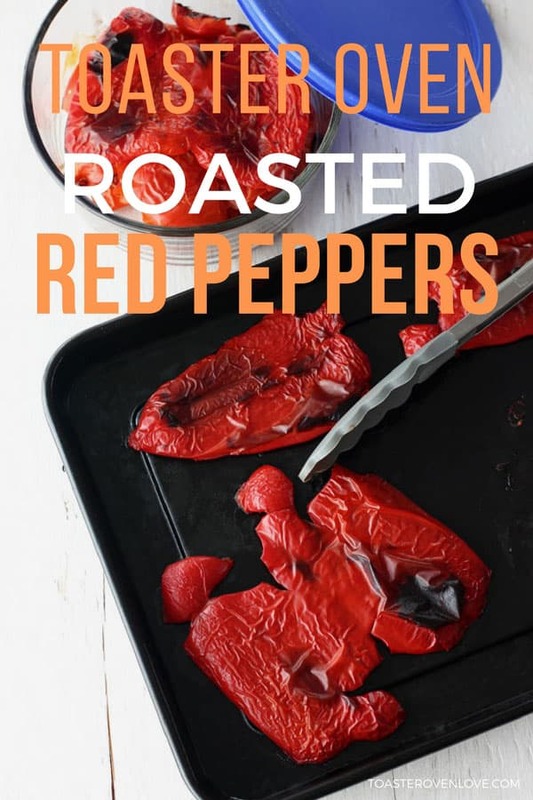 Why should you roast bell peppers? Roasting bell peppers (any color-not just the red ones) gives them a meaty texture, smoky flavor and intensifies their natural sweetness. Also, the thicker skin (which upsets some people’s digestion) is easy to remove after roasting. The sweet and tender peppers taste fantastic in vegetarian sandwiches like this Roasted Red Pepper, Carrot and Hummus Sandwich and are the perfect addition to a toaster oven frittata. The first takes a little longer and uses the “Bake” function. 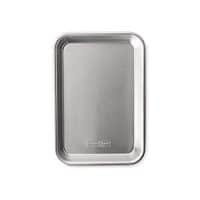 It’s a great option if your oven’s broiler cooks unevenly. The second option is super quick and uses the “Broil” function. 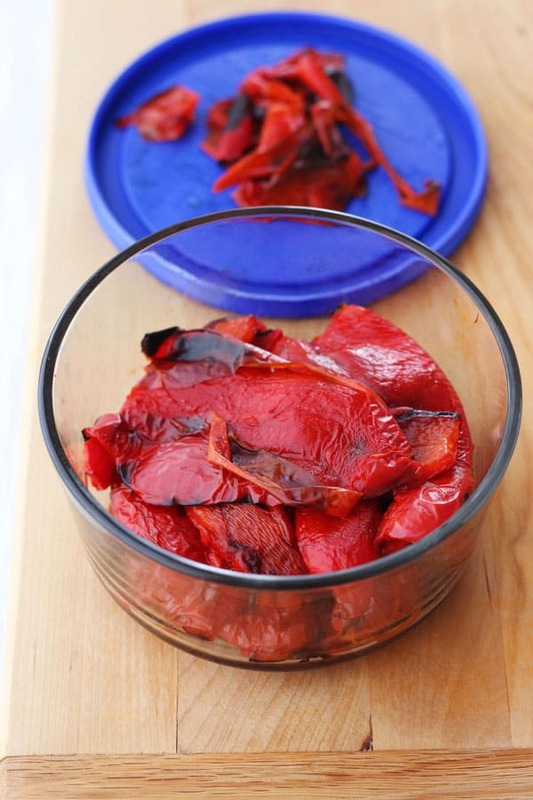 Regardless of the method you choose, you’ll always end up with a tasty batch of sweet and juicy roasted red peppers! 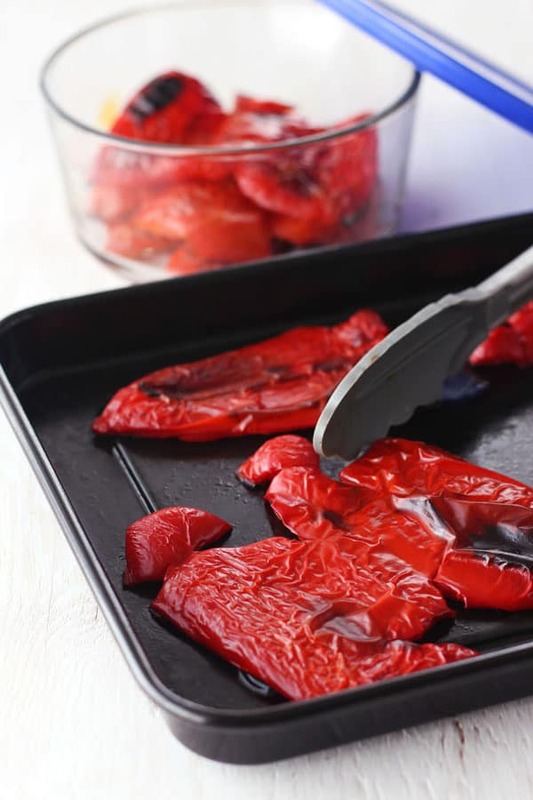 Toaster oven roasted red peppers make a flavorful addition to any meal, from pizzas to sandwiches and everything in between! Adjust the toaster oven cooking rack to the middle position and heat to 425°F. Lightly oil a roasting pan. Slice the peppers in half lengthwise. Remove the stem, seeds and any large pieces of the white pith. 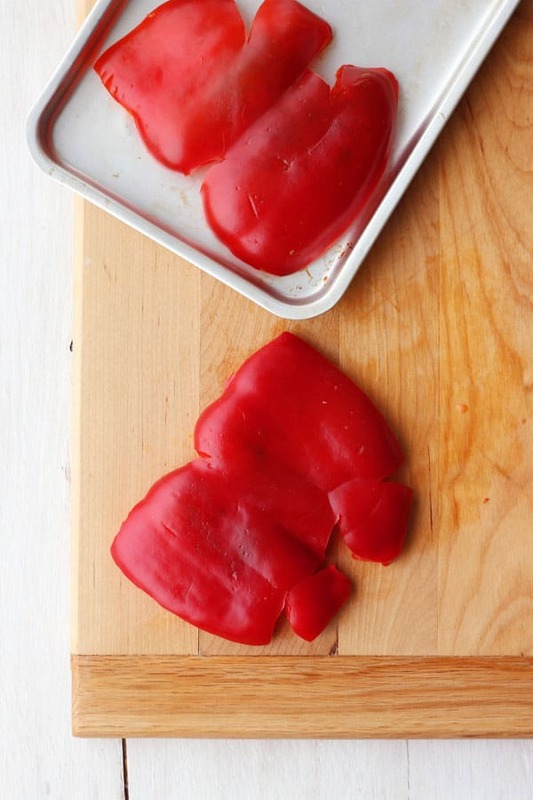 Place the peppers cut side down on a cutting board and use the palm of your hand to gently press down and flatten them. Arrange flattened peppers skin side up on the prepared pan. 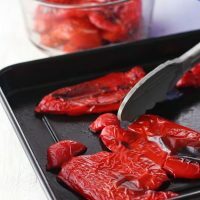 Roast peppers until they have begun to collapse and the skins are wrinkled and bubbled with black spots (12 to 20 minutes depending on the size of the peppers and your toaster oven). Quickly remove the peppers from the pan and transfer to a shallow covered container. Place lid on container and leave for at least 10 minutes to steam. Once the peppers are cooled enough to handle rub the skins off with your hands or with a paper towel. Leave the peppers whole or slice into strips or chunks before returning them to the covered container. Store refrigerated for 2-3 days or slice and freeze for up to 3 months. To Broil Your Peppers: Use the top rack position and broil the peppers for 8 to 10 minutes. Broiler Tips: The broiler element on our larger toaster oven was too intense and blackened the peppers before they had softened slightly. If you've got a strong broiler, for the best results adjust the rack to the middle position or Broil using a Medium temperature setting. Cooking method adapted from Vegetarian Cooking For Everyone. 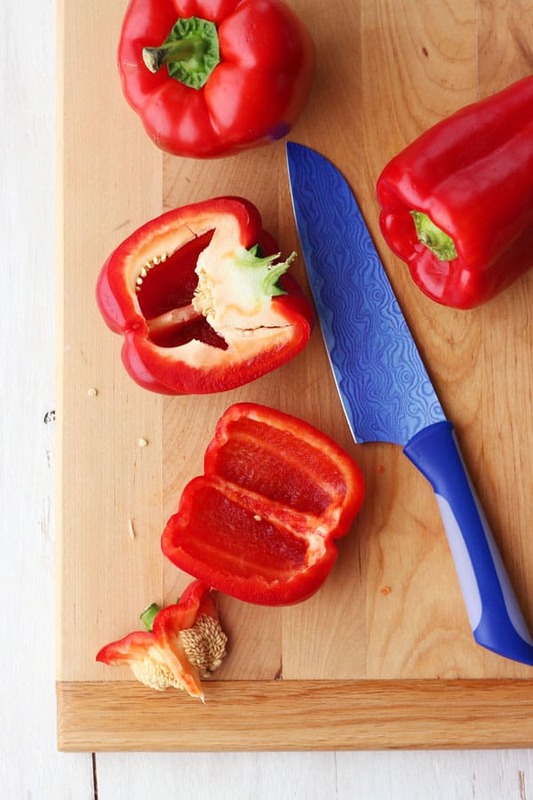 Start by slicing your peppers in half. By halving the peppers (instead of keeping them whole) you won’t have to turn or flip them while they roast. Next, seed them and remove the flavorless white ribs. Then, gently press the pepper halves as flat and even as you can. Don’t press too hard or you’ll burst the pepper’s cell walls. This will cause your peppers to lose a lot of their juicy flavor and make them dry. You want to cook the peppers until their skins are wrinkled and bubbled with black spots. For each cooking method below, the time is just a guideline. Roasting: Adjust the cooking rack to the middle position, set the “Bake” function on your toaster oven and heat to 425°F. Place peppers inside and roast for about 12 to 20 minutes depending on the size of the peppers. Broiling: Adjust the cooking rack to the top or middle position, place peppers in your toaster oven and select the Broil function. Broil peppers for about 8 to 10 minutes. Once your peppers are ready, you need to steam them to loosen their skins for removal. Some people use a paper bag or bowl covered with plastic wrap. 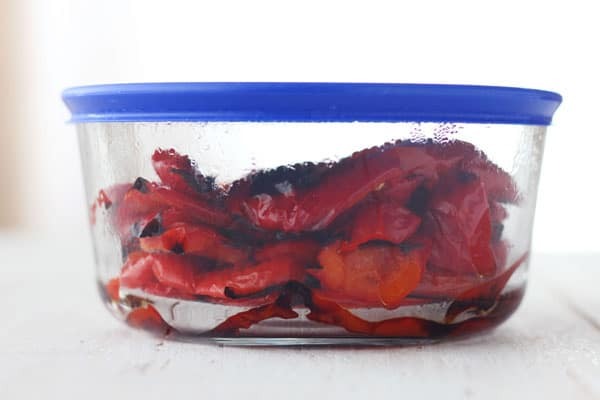 We like to skip the plastic wrap and use the container and lid we intend to store the finished peppers in instead. You could also transfer them to a plastic bag to steam or a bowl covered with a plate. Whatever method you choose, the key is stacking them on top of one another so the steam can loosen their skin. Once the peppers have cooled enough to be handled (about 10 minutes) you can peel off and discard the skins. Don’t try to get every last piece of skin off, a few roasted bits are okay. Also, avoid rinsing the peppers with water, it will wash away all of their flavors too. You can even mix the juices in the bottom of the bowl with a little oil and vinegar to make a tasty salad dressing! PIZZA! Red peppers are the perfect addition to all things pizza from these easy 15-minute Tortilla Pizzas to Toaster Oven Pizza Bagels and even Cheesy Veggie Pizza Spaghetti Squash Boats. 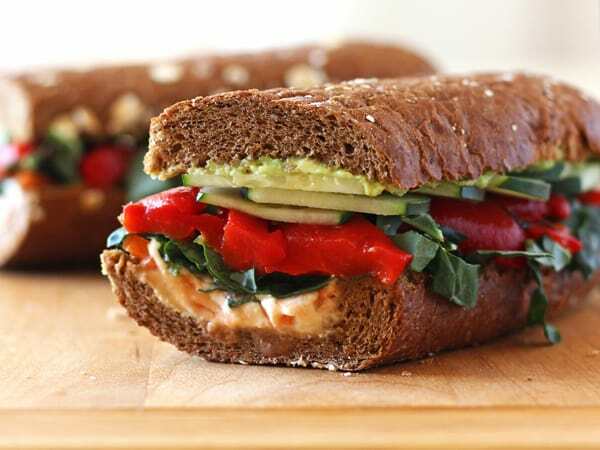 Thick and meaty, roasted red peppers are a great addition to any vegetarian sandwich but especially a Broiled Eggplant Sandwich that’s packed full of fresh veggies and a lemony avocado mash! 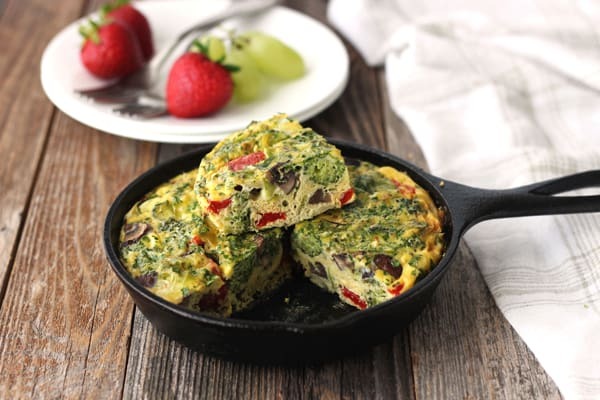 Swap juicy tomatoes for roasted red peppers in your next Toaster Oven Frittata. They’re sweet, bright and taste delicious with eggs and feta cheese.